The head of the United Nations Mission in South Sudan said there is reason to be hopeful that the country's transitional government will succeed. David Shearer said that following the signing of a new peace agreement, conditions have greatly improved from when former Vice President Riek Machar fled Juba in 2016. Shearer said Tuesday that the government has control of more territory, and there's an enormous push by the people of South Sudan for real change. "And I don't think either side can turn their back on that. And together with the way that the peace negotiations were conducted, it brought both sides together, and they were able to agree on the basic framework for going forward," Shearer said at U.N. headquarters in New York. Shearer acknowledged "some tricky issues going forward," and said while no agreement is perfect, the U.N. feels it is an agreement "that offers the best chance in a long while for moving South Sudan in the right direction." Shearer also said that while the U.N. is very mindful of the pitfalls that lie ahead, it is cautiously optimistic both sides are "committed to going down that path. And if that happens, it'll make an enormous change to South Sudan." Warring factions and the government of President Salva Kiir signed a new peace agreement in September 2018. Under the agreement, Machar, who led one of the largest rebel groups, expects to return home later this year and take part in the transitional government. The U.N. mission chief paints an optimistic picture of the current state of security in the country. He said civilian casualties have greatly diminished in recent months. In the last four months since the signing of the agreement, Shearer said there has been "a very significant decline in casualties as a result of political violence." But he said there's been an uptick in casualties with regard to cattle raiding. Shearer said the numbers are in the low 100s. 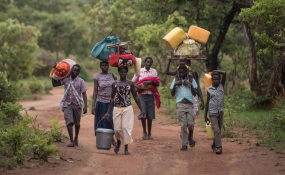 Some fighting continues in parts of the Equatoria region in the southern part of the country, but Shearer added the casualties "are in the 2s and 3s, not in the hundreds." And where peacekeepers patrol, such as around Protection of Civilian sites, Shearer said violence is almost non-existent. "Very low numbers, in the POCs it's virtually nothing. If there's anything, it will be criminal more than anything else and through the rest of the country, but the peace agreement and cease-fire has largely held," said Shearer. Some people have concerns about security when Machar returns to the country. The SPLA-IO leader is expected to come back in May when the pre-transitional government is supposed to wind down to make way for the transitional government of national unity. Shearer pointed out that a combined, pre-transitional committee, as outlined in the revitalized peace deal, will make decisions about security arrangements. "We believe that it's in the best interests of the peace agreement that the parties themselves decide how they want to handle those security arrangements. If they can handle them themselves, that is an enormous confidence step to being able to get things moving that does not involve the U.N.," said Shearer. To date, the U.N. has not been approached by any side regarding security for Machar's return.